Trash is making its way into our oceans at an alarming rate, and Channelkeeper is tackling this problem locally by hosting frequent beach and creek clean-ups to prevent trash from making its way into the Santa Barbara Channel. Channelkeeper adopted West Beach as part of the California Coastal Commission’s Adopt-a-Beach Program in 2006. As this beach’s adopted parents, we conduct at least four clean-ups each year. Check out the calendar page for an upcoming beach clean-up date or contact us info@sbck.org to schedule a clean-up with your group. 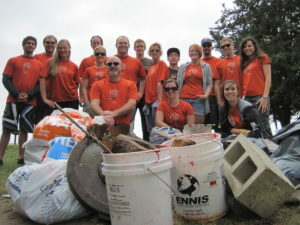 Channelkeeper also conducts quarterly creek clean-ups through our Adopt-A-Stream Program. We enlist individuals, families and businesses to volunteer to “adopt” a stretch of stream in their neighborhood and commit to conducting at least four clean-ups of their adopted stretch each year. Volunteers also help collect valuable water quality data by conducting standardized Rapid Trash Assessment surveys of their adopted site during each clean-up. Rapid Trash Assessment is a protocol developed by the State Water Resources Control Board as a means for citizen monitoring groups to systematically assess trash levels in streams in order to aid the development of water quality protection programs. Volunteers are always needed and appreciated to assist in our efforts! Check the calendar page for upcoming creek clean-up dates. In addition to picking up trash on land, every time we are out on our boat, we survey the Channel for marine debris and stop to pick it up as we go. We also partner with other agencies on additional clean-up efforts, including the Santa Barbara Waterfront Department on its annual “Operation Clean Sweep” harbor clean-ups and with UC Davis’ SeaDoc Society to remove discarded fishing line from local piers.